Make referencing your cookbook easy and convenient while protecting recipe book pages from splatters while cooking with this Kitchen Cookbook Stand. Featuring a clear plastic splashguard built in storage for recipe cards and a foam rubber pad to protect countertops from damage this kitchen cookbook holder has conversion table of common measurements printed on the splashguard to make calculating half and double batches on the fly easy and convenient. Kitchen Cookbook Stand Features Durable plastic construction lasts for years and cleans up easily. Clear plastic splash guard protects cookbooks and recipe cards from splashes and spatters while cooking. 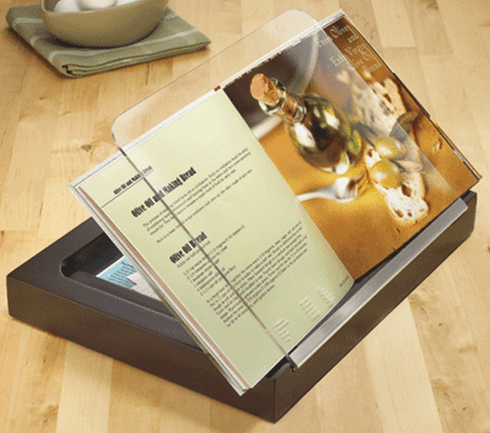 This cookbook stand holds the cookbook at a convenient angle making it easy to reference recipes while cooking. Built in storage space to keep recipe cards and cut-outs from cooking magazines neat organized and protected. Molded wood and acrylic cookbook stand with interior storage and recipe card clip. Acrylic splash guard features measurement conversion table. Espresso. 13 x 10 x 1". Design by Luciano Lorenzatti.